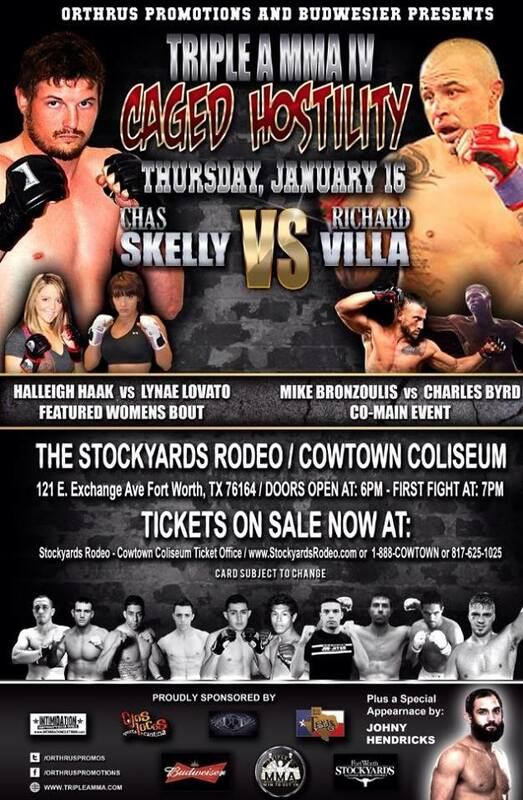 Starting the new year quickly, Orthrus Promotions will take their Triple-A-MMA brand into the Lonestar State of Texas for an event to be held on January 16th inside the Cowtown Coliseum Stockyards Rodeo in Fort Worth. It will be the first time the promotion has entered into the Texas region and they will be bringing along several New Mexico fighters to fill-out their fight card. Headlining the card, Roswell’s Richard Villa (8-5) will look to capitalize on a huge win from this past August and continue his rise up the regional ranks. Villa headlined the Jackson’s MMA Series 11 fight card and came out with a huge upset win over Gabriel “Moggly” Benitez who despite the loss is still on track to make his UFC-debut in 2014. Villa would lock up a tight leg-lock in the first round of that fight, stunning the odds-on-favorite to win and silencing a crowd expecting to see the emergence of the Mexican top prospect. Villa is a nine-year veteran of MMA and he will take on Chas Skelly (11-0). Skelly is an undefeated prospect from Texas who has notable wins over UFC veteran Daniel Pineda (twice), Tim Snyder and Rey Trujillo. The bout features two fighters that are well-known for ending their bouts via submission. In the lone WMMA bout, Lovato Total Fitness fighter Lynae Lovato will see action for the first time in over a year as she takes on Halleigh Haak (pro debut). Lovato is one of the most recognizable faces in the area’s WMMA scene and her return to active competition is guaranteed to be welcomed by a lot of fight fans who have seen her fight in the past. Her teammate, Stephan Cervantes (pro debut) will also be on the fight card taking on Young Yu. Cervantes had a tremendous year in 2013 fighting on the amateur circuit picking up wins over the highly touted Falon Ring and Judgement MMA’s Ozzy Chavez. Lutrell MMA’s Javier Palacios (2-0) and Steve Garcia (2-0)will also be in action; both fighters will head into the bout riding high on big wins for Bellator MMA. Palacios competed at Bellator 97 where he cashed in his “Win To Get In” opportunity that he was awarded fighting for Triple-A-MMA back in April. Palacios would win a three-round decision over Richard Jacques and now matches up with Matt Hunt (4-3) who has already fought New Mexican’s Hunter Tucker and Andres Quintana. Steve Garcia has a similar story to Palacios, fighting for Triple-A-MMA in April and then going forward into Bellator MMA. Garcia however, fought at Bellator 105 where he defeated the heavily hyped Shawn Bunch by late, third round stoppage. Heading into the bout, Bunch was one of MMA’s premier prospects and the talented Garcia wore him down over three rounds before he decisively finished the bout with strikes. Garcia will draw Xavier Siller (2-1) for the January 16th event. Also expected to compete on the fight card is Albuquerque Kickboxing’s Freddy Crosby (0-2) who will look to right the ship after two consecutive defeats. Fight fans may recognize the name of Mike Bronzoulis who was last seen in action against Joe Riggs fighting in the finals of the Bellator MMA reality show “Fight Master”. Bronzoulis will be in action against Charles Byrd. The “Caged Hostility” fight card is shaping up to be a quality regional card and with the addition of so many New Mexico trained fighters, the blend into the Texas market should be an interesting one. Stay tuned for more event coverage and results. 135: Xavier Siller vs. Steve Garcia Jr.